As Winter comes to an end, there is an excitement for the anticipation of Spring. Slaughter’s distinctive compositions painstakingly recorded the stunning seasons beaming with color. 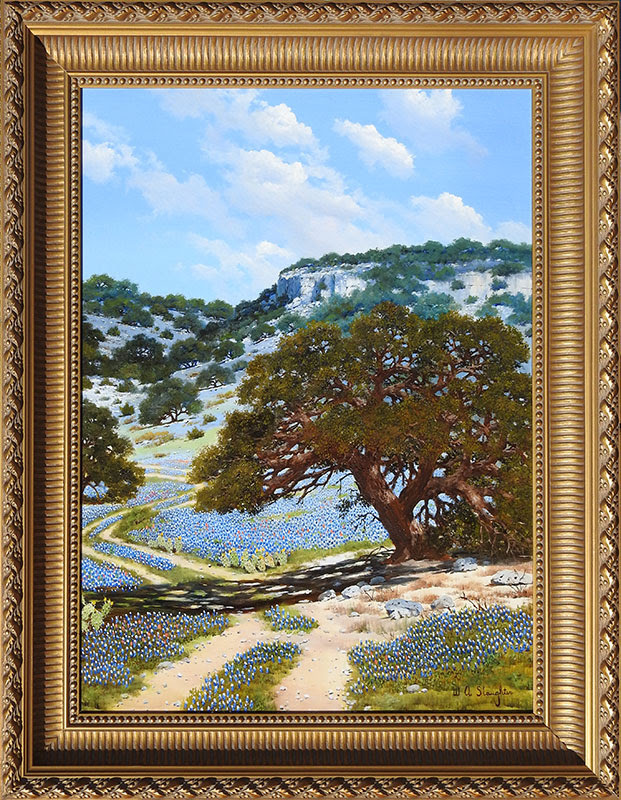 For over 50 years no one has captured the Texas Hill Country’s spectacular beauty more masterfully than W.A. Slaughter. This endearing collection of works encompasses all the seasons and speaks to all generations. Preview the show at www.swgallery.com! W. A. Slaughter was born in 1923 in Texas. Slaughter grew up in the Hill Country of San Antonio, Texas. From an earlier age Slaughter was noticed to have an artistic talent. The hills and scenery were early inspiration for his artistic ability and may also be the reason most of his pieces are landscapes. In 1952, after eight years of intense training, Slaughter became an official Lutheran minister. Moving from Lubbock, Texas to Mexico City, for ministry, his artistic side always beckoned at him. He combined his ministry with his art, to evangelize in another way. On his return from Mexico, Slaughter started exhibiting with the Artists and Craftsmen Association of Dallas. He took his ministry and put it into his artwork. In 1972 Slaughter decided to devote himself entirely to painting. Through his painting W. A. Slaughter believed he could preach the word. Slaughter looked on fondly of his hometown and this lead to a majority of his paintings be centered around landscapes he grew up with. Most of Slaughter’s canvases show his love for landscapes of all kind, from warm sunsets to rolling hills. Slaughter is extremely well known all across the Southwest to California. W. A. Slaughter passed away in 2003.